Rudy Gestede's first brace for Middlesbrough helped keep their play-off push on track with victory over Hull at the Riverside. 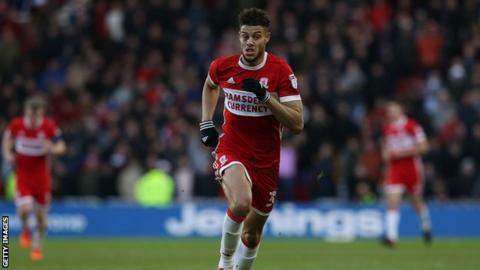 Gestede opened the scoring in the first half and added Boro's third after half-time, with Patrick Bamford's smart finish restoring the home side's lead. Hull were level late in the first half as Jon Toral's corner found Evandro, who fired a shot past Darren Randolph. But his first goal in the Championship did little for Hull's survival hopes. Nigel Adkins' side are now only outside the bottom three on goal difference, after Burton Albion's win at Barnsley, as they failed to build on Saturday's victory at Nottingham Forest. They found themselves level four minutes before half-time as Evandro scored his first goal for Hull this season on his ninth appearance, having missed the first three months of the campaign through injury. That was short-lived though as Bamford intercepted a loose pass, skipped past the challenge of Michael Dawson and delicately chipped Allan McGregor for his fifth goal of the season. Middlesbrough made the points safe just before the hour mark when Adama Traore drove to the byline and pulled a ball back for Gestede to finish cleverly into the right corner. "We've been a little bit shy in front of goal, so for Rudy to get two is great and he could have come off tonight with a hat-trick. "I thought Patrick Bamford was having quite a poor time in the first half, but then he comes up with that wonderful, wonderful goal, which will give him a lift. "There were good things and bad things again, and during the game that can frustrate you, but it's a really good three points. "The goals were gave away were dreadful, and if you're defending like that, you're never going to win anything. "We get ourselves back into the game with a great goal from Evandro but then we shoot ourselves in the foot again right on the stroke of half-time. "We have come away to a good team and played well, but we've gifted them three goals and you just cannot afford to do that." Match ends, Middlesbrough 3, Hull City 1. Second Half ends, Middlesbrough 3, Hull City 1. Attempt missed. Jackson Irvine (Hull City) header from the centre of the box is too high. Assisted by Evandro. Corner, Middlesbrough. Conceded by Allan McGregor. Attempt saved. Adama Traoré (Middlesbrough) right footed shot from the right side of the box is saved in the bottom left corner. Assisted by Rudy Gestede. Attempt missed. Grant Leadbitter (Middlesbrough) right footed shot from outside the box is too high from a direct free kick. Attempt saved. Kamil Grosicki (Hull City) right footed shot from outside the box is saved in the top centre of the goal. Assisted by Adama Diomande. Attempt blocked. Will Keane (Hull City) left footed shot from the left side of the six yard box is blocked. Assisted by Adama Diomande. Delay in match Darren Randolph (Middlesbrough) because of an injury. Attempt missed. Dael Fry (Middlesbrough) header from the left side of the box is close, but misses to the right. Assisted by Stewart Downing with a cross following a corner. Corner, Middlesbrough. Conceded by Jackson Irvine. Substitution, Hull City. Adama Diomande replaces Fikayo Tomori. Foul by Ola Aina (Hull City). Substitution, Middlesbrough. Jonny Howson replaces Patrick Bamford. Substitution, Middlesbrough. Adam Clayton replaces Muhamed Besic. Substitution, Hull City. Kamil Grosicki replaces Jon Toral. Foul by Michael Hector (Hull City). Corner, Hull City. Conceded by George Friend. Attempt saved. Evandro (Hull City) right footed shot from the right side of the box is saved in the top centre of the goal. Assisted by Jon Toral. Goal! Middlesbrough 3, Hull City 1. Rudy Gestede (Middlesbrough) right footed shot from the centre of the box to the bottom left corner. Assisted by Adama Traoré. Attempt missed. Rudy Gestede (Middlesbrough) right footed shot from very close range is high and wide to the right. Assisted by Stewart Downing with a cross following a corner. Corner, Middlesbrough. Conceded by Angus MacDonald. Attempt blocked. Muhamed Besic (Middlesbrough) right footed shot from a difficult angle on the right is blocked. Attempt blocked. Muhamed Besic (Middlesbrough) right footed shot from the right side of the box is blocked. Assisted by Patrick Bamford. Attempt missed. Patrick Bamford (Middlesbrough) left footed shot from outside the box misses to the right. Assisted by Adama Traoré. Delay in match Jon Toral (Hull City) because of an injury.